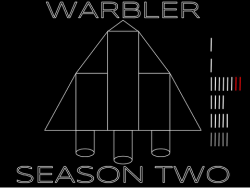 Warbler is dedicated to my Grandmother, who sadly passed away as I finished preparing Warbler for primetime. She was my first fan, and an endless source of support, from the juvenile, borderline-fanfic disaster that was Adventures in Woodland, to my success in the Dragon Mountain competition, at which point I personally began to believe that I might just be a writer, to No More Lies, the first piece that I was entirely happy with, or at least, as close as any artist ever comes. She will forever be truly missed.